Now that your young child has taken an interest in printing his name, it's time to find a penmanship program that will help him gain control of his fine motor skills. That's where Penmanship to Praise Manuscript fits in! When you use this program as part of your homeschooling routine, you'll take your child through the alphabet three times. The first time your child will use three-inch lines; the second time, two-inch lines; and the third time, one-inch lines. From scribbles to legible letters, your child will be printing in no time! Included in this program is a list of things you should watch for as your child begins learning to print. Seven tips will help you ensure proper posture, pencil hold, and practice time. Once your child completes this program, he's ready to move on to Penmanship to Praise Kindergarten level. Easy to use, all the necessary instructions for teaching are included. Penmanship to Praise books are consumable, so you'll need a book for each child you are teaching. Levels are available for children through 6th grade. This program can also be used independently of The Weaver Curriculum®. 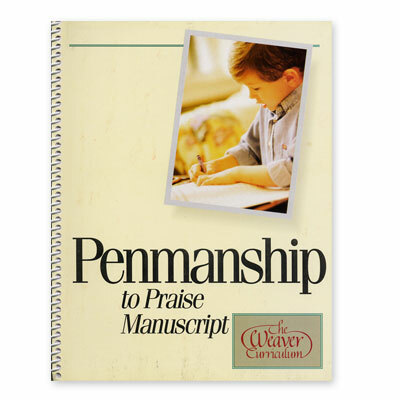 Order your copy of Weaver Penmanship to Praise Manuscript from Alpha Omega Publications and watch your child's handwriting flourish!